The Transparency and Accountability Initiative (TAI) is a collaborative of leading funders of global transparency and accountability programming. We are committed to development through empowering citizens to hold their governing institutions to account. We seek to galvanize support for ambitious new ideas and promote more impactful funding, building on the momentum of the thriving global transparency and accountability movement – all the more important in the current global context. Building on successes to date, which include playing a key role in the establishment and implementation of the Open Government Partnership and helping bridge communities of technologists, data scientists, and transparency researchers and activists, TAI has an exciting new strategy focused on scaling donor impact. The members (Ford Foundation, Omidyar Network, Open Society Foundations, William & Flora Hewlett Foundation, the UK’s Department for International Development, and the MacArthur Foundation) are aligning efforts around shared priorities, including pursuing more transparent, equitable and inclusive tax systems and informing and empowering citizens and governments with data. TAI is a platform to facilitate knowledge sharing and collaboration, and foster a culture of learning among both donors and practitioners. TAI is seeking a student based in the Washington DC area to join our team as fellows for approximately 24 hours per week this spring (approximately February 4 to April 26, but exact dates are negotiable). Fellows will have a diverse and evolving range of responsibilities, flowing directly from the team’s emerging needs. As TAI maintains a lean team, fellows will have the opportunity to make a significant contribution to TAI’s work and the transparency agenda. For example, fellows will have a specific research project, will play a key role in developing the content for our new website, lead on certain donor outreach and engagement through online mediums, support workshop design and execution (including logistics), and author material on TAI program areas. Strong candidates will have exceptional research and writing skills, strong communication experience, and enjoys working collaboratively. Graduate students are strongly preferred. Candidates must have current authorization to work for an employer in the U.S. While our team is small, TAI has a broad reach: we work closely alongside our donor members and are based in the OpenGov Hub, a co-working community of over 35 organizations dedicated to transparency, accountability, and civic engagement. Fellows will have the opportunity to continuously engage with this network to positively inform their work and to develop a nuanced perspective of the governance sector. Ideally, fellows will also share our passion to build vibrant citizen-state relationships around the world and thrive in a fast-paced “start-up” environment. TAI offers a $2,500 stipend for the semester for this position. 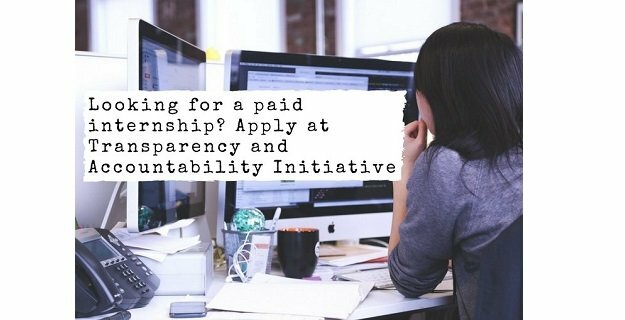 Please send an email briefly outlining your interest in the role together with your CV/resume and written work samples to contact@transparency-initiative.org. We hire interns for summer, fall and winter and applications are reviewed on a rolling basis.